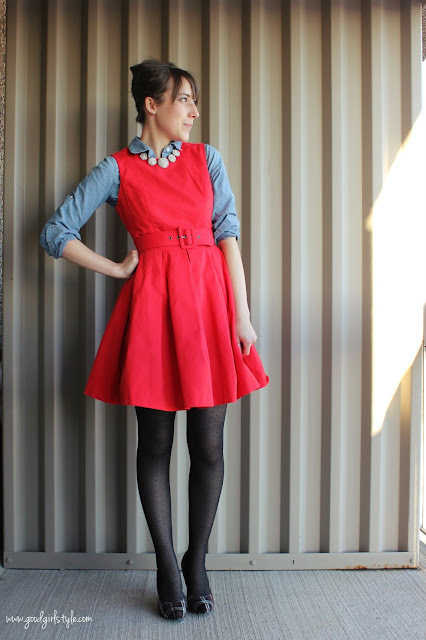 Layer your dress: A heavy-duty red material, layered with a chambray shirt makes sure this ensemble stays cozy. 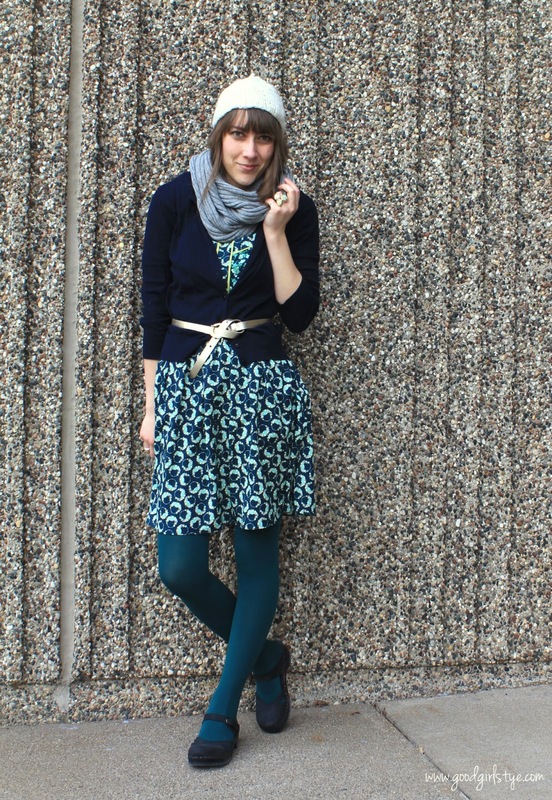 Layer with Merino Wool: Layer over it with a merino wool sweater and merino wool tights. Discover Bootights: LOVE these tights with a sock attached. They are made in USA, high-quality, durable, and have a sock attached. Choose Appropriate Dress Materials: Heavy vintage silk, velvet, and wool are all great choices. 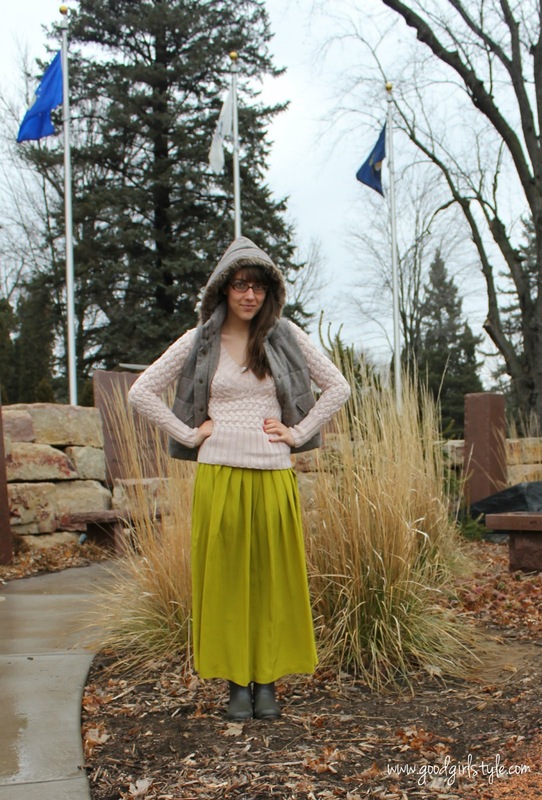 If you are wearing a lighter-weight dress, be sure the colors say "winter." Add lots of layers and color! You can even do fancy in the winter without being freezing! These tights are a great find (Target, of course!) and pair perfectly with a heavy silk vintage dress ($10 from the 'needs work' bin at my favorite vintage store...and I'm happy to work on pretty vintage dresses!). Then I wore my bright red wool coat. I hope this gives you some ideas as we face these last dregs of winter! Be well and be warm! 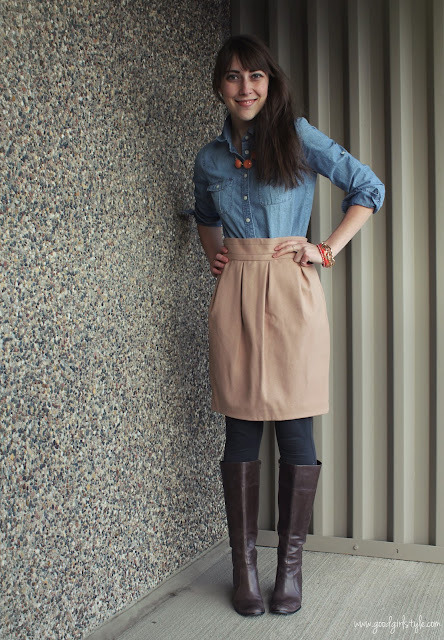 I love your style - so cute! I've never been a tights fan, I love them on other people... but I get tired of fussing with them so I tend to scrap the idea of dresses until I can just wear bare legs. So sad, huh?? The chambray shirt khaki skirt combo is my fave. So classy and chic! so much awesome i cannot stand it. seriously! this just goes to show that when you create a wardrobe out of classic quality pieces, the combinations are endless. absolutely lovely collection, and one i will be pinning for future reference!! The Tights just look awesome. They can be worn in winters and summers both. The wardrobe is definitely incomplete without it. I love these tips and outfits, thanks! !